We offer an Affiliate Program for our Personalized Replicated Website subscribers. With a paid subscription to one of our replicated website templates, any time someone else purchases a subscription from us by joining from your website (1st level referral), you will earn an affiliate customer referral commission. Additionally, when someone subscribes from the website of one of your referrals (2nd level referral), you will also earn a commission on that level too! But wait - there's more... Not only will you earn referral commissions for new subscriptions, but you will earn those same referral commissions over and over again each time your referrals renew their subscriptions - as long as you maintain your active subscription at their renewal time. so actual payments are a couple percentage points less than $15 and $5. so actual payments are a couple percentage points less than the calculated earnings. 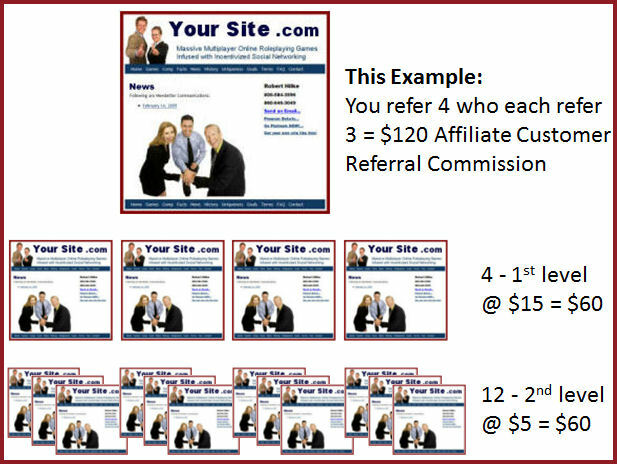 By simply referring four who each refer three, your commissions will cover your annual subscription cost plus put $20 in your pocket. But there's no need to only refer four - you can refer as many people as you like, so the sky is the limit for how much you can earn! Be sure your annual subscription is active and has adequate funding available through PayPal and your Affiliate status with us will remain active. When you first subscribe to our website with PayPal, you agree to an annual renewing subscription with us through PayPal, so unless you canceled your subscription you will likely find that your subscription at PayPal is active.